Thank you to all the historians who have responded. This is our last Call for Speakers. to see if your “defining moment” fits in with the 2019 conference theme. and people (some famous, some little known) have dramatically influenced the course of the region. This conference explores the impacts, intended or not, of decisions that have brought us to where we are today. Historians, researchers, writers, and storytellers: Each year the Congress of History presents a history conference on topics that reflect our region. We’ve done conferences on big themes (like the impact of world wars on the region). This year we seek talks about a defining moment within the past 250 years. This defining moment might be an event, movement, activity, uprising, or change in thinking that could have been impactful to the entire two-county region or to a specific town or area. What defining moments do you want to bring to our attention? What defining moments are important to you from the Founding Era (roughly 1769-1850), the Middle Era (roughly 1850-1950), and the Modern Era (roughly 1950-2000*)? [*Our cut off for this history conference is the year 2000.] And you don’t have to be a professional speaker, writer, or historian. Great presentations come from those who care! Are you an author? Bring your books for sale! • Your topic may be something not widely known that had a big impact on a place. • Or It may be about a person who did something of great impact in the region. • Or it could be about an incident that changed the course of events. If it was a defining moment, we want to hear your take on it! Geographic Area: COH organization members range from southern Orange County to northern Baja California. Please use this region as your guide for proposing your historic talk. Conference Format: 16-18 speakers over two days, each giving a 20-minute talk with 10 minutes for Q&A. Speakers must have a PowerPoint presentation (with lots of photos please, not so heavy on text). We are excited to share with you the names of the historians who will be presenting “Defining Moments” at the 54th Annual Conference on March 29 and 30, 2019, at Portuguese Hall. See the end of this article for the list. You may recognize some names of experts who have spoken at past conferences, while other speakers are joining us for the first time. Many of our talented speakers are also authors, and they will have their books available at the conference. Topics from the Founding Era (1769 to 1850) will range from the initial Spanish exploration and settlement of the region, where Native American trails became the El Camino Real, the road northward, to how a modern day “mission walker” made the entire 1,600 mile journey herself while beating cancer. Sometimes fate can turn on a dime. But for the want of an anchor in 1770, the fragile San Diego settlement would not have survived. You’ll hear the extraordinary history of how Franciscan frontiersmen traveled all over the southwest, and their lasting contributions to the region. and what it meant to the success of both counties. Sometimes history sneaks up on you and has unintended consequences. You’ll learn how a San Diego neighborhood railroad became part of a giant national rail connection. You’ll also find out how a Progressive, well-intentioned state law to help build public works projects backfired terribly from the crushing local burden of repaying bonds. Without proper infrastructure for a growing region, we wouldn’t be able to feed ourselves. Representative of so many rural areas, learn how the creation of a water district allowed for a steady supply of water for rural agricultural development. The Native Americans have always lived here. In 1932, one band took the long view with clever thinking while being relocated to keep their people and their future intact. The Congress of History has had conferences about wars before. You’ll see a different side of war via the poignant letters of students from San Diego State College, some of whom returned and some of whom did not. We’ll tell you the story about a very important African-American San Diego man who illegally (for the time) purchased a home for his family in 1947 in a restricted neighborhood, then went on to continue to break barriers and build partnerships in public service for over 50 years. Does anyone remember slide rules and outstanding accomplishments made before computers? In the Modern Era (1951-2000), hear the fascinating true story of General Dynamics, the Atlas missile, and San Diego’s role in space from the youngest engineer on the team. Were you here in 1963? Culturally the Modern Era was extremely dynamic. Learn about how art and poetry came together for the avant garde, then hear how the Mexican-American community made history with the creation of Chicano Park from someone who was actually there. In theater, our region is known for developing plays and sending them to Broadway. You’ll understand what forces lead to that happening. And finally, everyone deserves a voice in preserving their history. You’ll see how one group claimed their history and created their own archives to share their struggles. I am excited to be part of the Congress of History and the dedicated historians and history buffs who have volunteered untold hours to bring this conference to you. Thanks goes to our cosponsor, the Portuguese Historical Center, without whose support and partnership we couldn’t bring this quality programming to you in such a great setting. 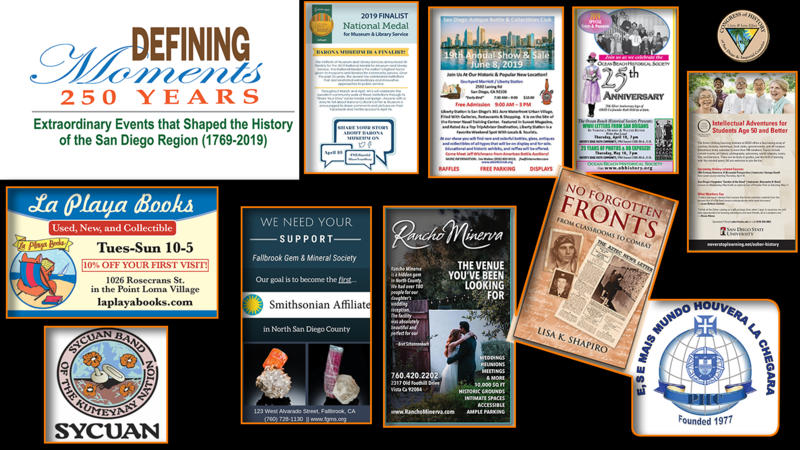 We again will have more than a dozen historical organizations with booths at the event, along with two history-supportive booksellers. Thank you to everyone for making this another great conference! The conference registration form is available at our website atwww.CongressOfHistory.org and in Adelante. Please register today, and bring a friend. Share with others in your organization about this event. Support the organization that supports your work. And if you know of a deserving person or organization doing great things in our southern California region, don’t forget to nominate them for a Congress of History award. Below is a list of confirmed speakers and the working titles for their presentations. We can’t wait for you to meet them in person at the Conference! We will post photos and a recap soon. We would recommend a visit to this wonderful center and take a tour.